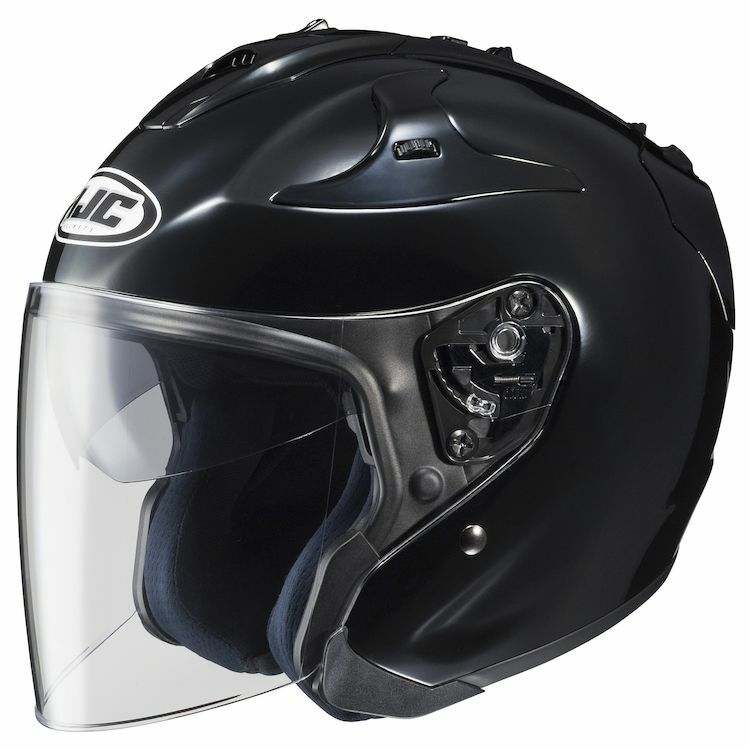 The HJC FG-Jet Helmet is a modernly-styled open face helmet that features a full face shield for keeping the wind and bugs at bay. The FG in FG-Jet stands for fiberglass. The use of fiberglass makes for an exceptionally high strength to weight ratio and it is the material of choice for most premium helmets. Fit: Runs slightly small and offers a snug fit. Sizing up 1 cm is recommended. For example, if you measure in at 59cm go with an XL instead of a LG. Note: The HJC logo on forehead may differ slightly from images shown. To replace a Full Face model of the same brand, wanted more cooler helmet for summer riding. Great helmet for the money. Great air flow and sun visor. Made well, good features, great price. HJC make very good helmets! I currently have the IS-33 and based on its age it needs replacement. I decided to upgrade this time to the JET because of it's review and it looks like it has a very good ventilation system. Like the built in sun visor as well as airflow ability. Love this helmet. Would recommend to anyone. Great airflow and like the dark face shield. I have used the IS-33 helmet for over 3 years now and just love it. It is worn out after about 30000 miles and I wanted to replace it wit an even better helmet. If this fits as well as the IS-33, I will be very pleased. For my wife as a helmet so she can begin riding with me. Wanted a 3/4 helmet for warmer weather. This helmet had the features I was looking for & had good reviews. Swapping this out for a Bell that i ordered. The retro helmets aren't my thing, i guess. Vents! Revzilla recommended this one, got it and it was way too small, so returned. Good fit and built in sun shield got one for myself and wife. The affordable price is great! It seems to be an all around helmet for any rider. Especially for my big round head. lol. Anyways I've had a CL-Max modular helmet before and it seems to have a lot of pressure on my cheeks. Hopefully this 3/4 helmet would solve that issue. I am on bigger side weighing 230 lbs with a big round head. i chose this helmet because of the fit and i finally found a helmet that i can put my eyeglasses on with ease, also the 3 /4 gives me a much larger view. I needed a helmet that would provide me with the most amount of vision and comfort while being as quiet as possible. Revzilla crew recommended this one. Havent ridden in a while so looks like a good starting point. Great helmet, great fit. Perfect for the Sena S20 comm system!!!! Got a is-33 II last year in xtra large to tight on forehead these are definitely round not intermediate oval I think. So got 2xl in this and is good fit now. I prefer a 3/4 vs full face, and the HJC FG-Jet got great reviews. I had A large shipped a great helmet I love it but it was a little tight but fits my wife fine and she likes it so we kept it for her and I got the next size up. I already have HJC modular helmets, as they are five (5) years old it's time for a fresh set to go with the new ride. wanted an open face helmet for my street bike and this works great. Style... But this helmet is too noisy and was already sold! The extra vent in top of helmet, and it will work with my intercom system. I like the pricing of the product for what you get. I've had HJC helmets in the past and have been very satisfied with them. Wanted a 3/4 helmet for city riding in summer time. Helmet for my girlfriend. Picked this helmet because she liked the way it fit when she tried it on locally. Specifically bought it from Revzilla because of the price and free shipping. I'VE HAD ONE OF THESE FOR THE LAST THREE YEARS. VERY GOOD HELMET. COMFORTABLE AND DOES NOT TEND TO COME OFF WITH THE WIND. The longer face shield to protect from the cold and the more advanced technology over the IS-33 helmet. We have HJC helmets and love them! Seen a HJC ad in Rider Mag, And I read some favorable reviews.. Also I have an HJC helmet modular and I'm happy with it. The price, lightweight, venting and the fact it will accommodate speakers in the ear cavities. This helmet appeared to be a step up from the IS-33 model. I am actually disappointed in this HJC (white) helmet, and that is a first for me. I have owned many HJC helmets in the past and they have always met my needs and worked flawlessly. This helmet, however had the slider piece on top just snap off under normal use and a small plastic piece for one of the top vents also failed. I treat all of my helmets with kid gloves but for some reason this one had both of these failures. I'm not sure how to get it fixed or replaced so any assistance would be appreciated. I am purchasing a new hi-visibility HJC helmet today but I would still like to have the other one as a spare. Is there a pinlock version or version of the shield coming in the future? Would this helmet even benefit from a pinlock? BEST ANSWER: No pinlock and yes it would benefit. by your mouth it does fog up while at a stand still. Clears up when you start moving. Can the shield be replaced with a visor? How do you install a headset? There seem to be no room between the liner and shell to attached the mic/cord piece? Do HD Boom audio communication headsets work with this helmet? Does anyone have advice on how to solve the loudness of this helmet at speeds above 25mph? I own other HJC helmets, and this FG is the only one that I own that is so loud when riding. It's very discernible. It's winter here, so my vents and sun shield were already closed. BEST ANSWER: I've noticed the same problem. Doesn't seem to be a problem with the face mask up... But that doesn't help much in this weather. I agree, very loud helmet and you must use ear plugs. When shield is up or removed its much quieter. what are the different between FG-JET & IS-33? My wife has the IS-33 and she loves it. I decided to go with the FG-Jet and like it as well. However, there aren't huge differences between the two. It seems the IS is made with polycarbonate and the FG is fiberglass. Not positive the benefits to these materials but there isn't a noticeable weight difference. The main difference I see is an extra vent on the FG in the middle on the top. Otherwise they are virtually the same. Visors are the same and work alike. There are just subtle differences in styling and the FG vents look to be a tad bigger with more user friendly open and close switches. If money is an issue the IS will work just fine without wishing for more. The FG-Jet has a plusher interior and has better ventilation. The fit of the FG-Jet is better than my IS-33 so it may be very slightly more oval than the rounder IS-33. The Shoei Qwest is a perfect fit for my head shape. The FG-Jet is a positive evolution of a very good IS-33 helmet. I bought the FG-Jet only for a more conspicuous color. All I can tell you is that the FG is relatively quiet and easy to use. I am very happy with it, except for the the sun lens lowering dial on top of the helmet that broke off within days. The FG-JET has better air flow. The sun visor also comes down further. Both helemts are excellnt but the FG-Jet is woth the extra money. Can't help with the IS-33 but my wife really likes the FG-JET. Very comfortable and good fit. Any issues riding with the outer shield removed? Is the attachment mechanism easy to gunk up? Other than that, little kids think you look like a fighter pilot.! No issues with gunking up the mechanism. But I'm a street/highway rider. No issues whatsoever. Can't speak for off road use. Finally. Since I'm publicly posting online about this helmet. I really, really wish HJC would have created a optional sun visor that would snap in place of the outer shield. That would have made this really good helmet even better. During the warmer months I typically rode without the shield on and had no issues. The internal sun visor was out far enough that I could drop it down over my eye pro if it was really bright out. Wind noise was more noticeable but still very tolerable. Attachment mechanism has been fairly robust from what I can tell. However, I will say that snapping the shield in place with the helmet on is a bit of a PIA . I've always had to take the helmet off first to line-up the positioning of the attachment point. On colder days, the shield makes a world of difference. Since there isn't a nose deflector like on some full faces, the shield will fog a bit while at a stop. The minor issue is easily remedied by bumping the shield up one notch while stopped. I found the helmet runs tight and I like them looser. I should have gotten a size larger. I also found the sun visor hits my nose and leaves marks so that part did not work for me. This may not answer the question but it is what I have to offer. As a result I do not use the helmet and am keeping it only for others to use if they ride with me. Never have any issues with the shield nor helmet. On the hot days I just ride with shield up, it moves far enough that you don't need to remove it. I have four other helmets and this is my summer helmet and I didn't need to remove the shield to ride it. hope this answer your question. The attachment shield is easy to remove and reinstall. I have never tried to ride without it removed. The helmet is very comfortable to wear for long rides. Does the clear visor offer UV protection? BEST ANSWER: I am not sure about UV protection but it does reduce the UV enough that my glasses don't get dark the way they do when I am not wearing the helmet. I'm not sure. I bought this helmet for my wife and she wears sunglasses while riding. You might have to check with the manufacturer. I don't know. Tinted sun visor works well. does the drop down sun visor interfer with glasses? BEST ANSWER: I have two pairs of glasses. My smaller pair fit with the sun shield down (barely) my larger pair of glasses do not fit with the sun visor down. The drop down is very close to your face and can even touch the bridge of my nose but I have had no trouble with it touching my glasses. I wear several different styles of Oakleys (Fuel Cell, half jacket, fast jacket, Juliet) none of them hit. Great helmet! I'm looking at the FG-Jet vs the IS-33 ii (there are comments below on the IS-33 but not the IS-33 ii) - I'm curious whether anyone has an opinion on the two? BEST ANSWER: Jason, I have the FG-Jet. I've had it for two years. I have 5 other helmets so it isn't my only helmet. It is light and I also chose white for summer rides so that it wouldn't absorb too much heat. The fiberglass construction makes it lighter than my polyshell helmets. The internal sun visor is very convenient. I will tell you that HJC runs a little tight. Since I don't wear it exclusively, it has remained a bit tight. It is not the quietest and the top side vents are roller controlled and are not the most reliable and very difficult to adjust on the fly. The rocker and slide switches are the easiest to control. The center vent is a rocker type and is easy to open and close. The D-ring latch is OK, but once you start using the micro-ratchet latches, you'll wish it was that way too. I ride to work most days and as I am answering your question, I used the HJC today. Hope this helps your choice. Happy riding and be safe. The Jet is still supposed to be HJC's top of the line helmet even though its an older model compared to the IS-33 II. I tried both on in the store and went with the FG-Jet. The Jet has better (and more vents) and is also fiberglass. It does NOT have speaker cut outs like the IS-33 II but the ear section is still deep enough to fit speakers. I have a SENA SMH-10 installed on my FG. The ear phones fit behind the liner. If you look closely at the liner, the ears fit into a cut out part of the padding and the earphones can be placed directly into that space without actually touching your ear. They are quite close but still leave a little room.